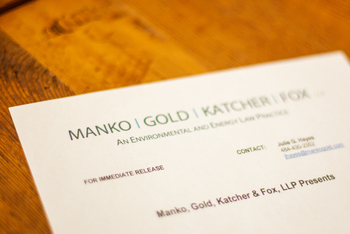 Jonathan Spergel, Managing Partner of Manko, Gold, Katcher & Fox, LLP ("MGKF"), the environmental, energy and land use law and litigation firm based in Bala Cynwyd, PA, participated on a panel with colleague Bryan P. Franey, Esq. on "Practical Considerations for Buying and Selling Contaminated Property". Their presentation was part of the Delaware Valley Chapter of the Association of Corporate Counsel’s Real Estate CLE program that took place on Wednesday, November 5 at the Union League in Philadelphia.